Affiliated with The Christian and Missionary Alliance. Undergraduate degrees offered at Nyack College include: Associate in Arts, Associate in Science, Bachelor of Arts, Bachelor of Science, Bachelor of Music, and Bachelor of Sacred Music. 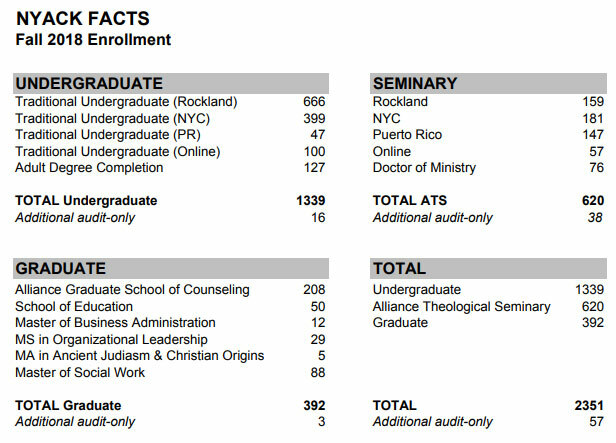 Graduate degrees offered at Nyack College and Alliance Theological Seminary include: Master of Business Administration, Master of Arts, Master of Science, Master of Divinity, Master of Professional Studies, Master of Social Work, and Doctor of Ministry. Chartered by the Board of Regents of the University of the State of NY. Curricula registered with the NY State Education Department and approved for training of veterans. Listed by the US Department of Justice for educating international students. Commonwealth of Puerto Rico by the Council of Higher Education of Puerto Rico. School of Music: National Association of Schools of Music (NASM) since 1962. Member and accredited by the Association of Christian Schools International (ACSI) for teacher certification. Childhood Education programs are nationally recognized by the Association for Childhood Education International (ACEI). Childhood Special Education programs are nationally recognized by the Council for Exceptional Children (CEC). Teaching English to Speakers of Other Languages program is nationally recognized by Teachers of English to Speakers of Other Languages (TESOL). School of Nursing: The baccalaureate degree program in nursing at Nyack College is accredited by the Commission on Collegiate Nursing Education (http://www.ccneaccreditation.org). School of Social Work: Social Work program has been approved for accreditation with the Council for Social Work Education (CSWE).